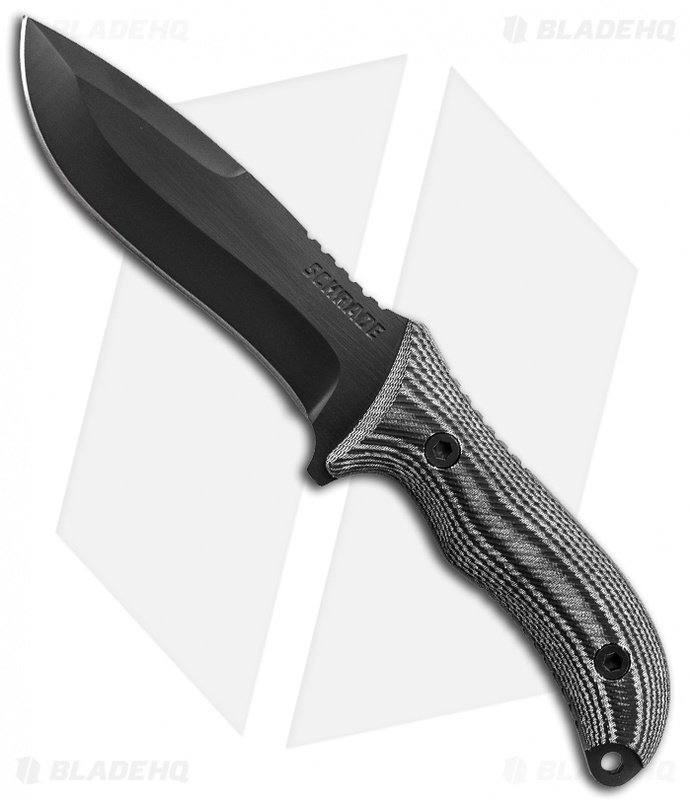 Schrade's Extreme Survival SCHF10 has a modified drop point blade with a swedge that improves piercing dynamics and adds additional flare. The blade has black coated full-tang steel construction with textured black/gray Micarta scales. 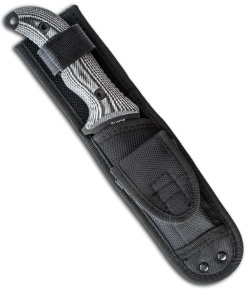 Included with a heavy duty nylon sheath. The knife is bigger than I imagined after looking at the description numbers, and while that tickles most sportsmen, I actually wish it were a bit smaller. The sheath is puzzling, not quite up to the knife's standard of quality, and if there is a pocket for a stone, there should be a stone included! Don't you agree? Of course you do. Amazing little tank for the price, just that the sheath could be better, but it’s not hard to replace. Over good large fixed blade. Great knife for very little cash. Sheath is OK and the entire package deal makes for a great beater knife that you don't mind putting through it's paces outdoors. This is a good, solid knife to stow away for use when needed. The knife has some aggressive (ish) jimping on the rear bottom and top front of the sturdy, good feeling handle, along with additional jimping on the spine for some finesse work, if needed. The sheath does have a handy little front pocket on it for a fire starter kit/sharpening stone, along with a plastic insert for the blade and a hook & loop fastener for knife retention. It is just okay quality, but at this price point, I still see the sheath as helping with the overall value of this knife. Used it to chop some sticks/branches that fell in my yard a few days ago and it just powered through it all. 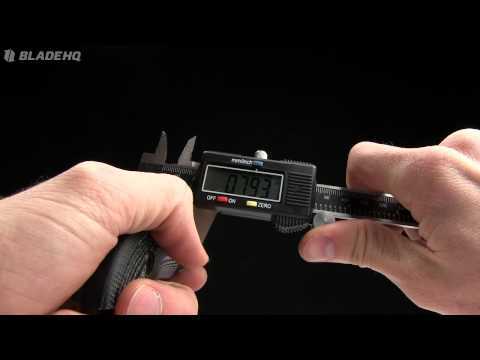 8Cr13MoV isn't all that bad and since I'll be using this knife for really gritty, hard, and honestly abusive work, I'm not too concerned of it losing its edge or chipping a small piece off.I mean, it was only $25. You get what you pay for and I gotta say you get a lot for what you pay for. Good job Schrade. If this knife breaks years in the future, I'll just buy another one.